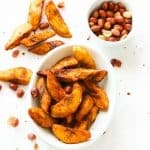 Kelewele or Aloco(Spicy Fried Plantains) - African spicy fried ripe plantains that is crunchy on the outside and soft on the inside. Goes well with peanuts and as sides for any protein. cut only as deep as the peel. Remove plantain peel by pulling it back. Cut plantains in diagonal pieces and set aside. Using a slotted spoon, transfer the fried plantains to pan lined with paper towels.